Crystal Cox is a true American Hero, she was brave enough to see wrong and do her best to EXPOSE it. 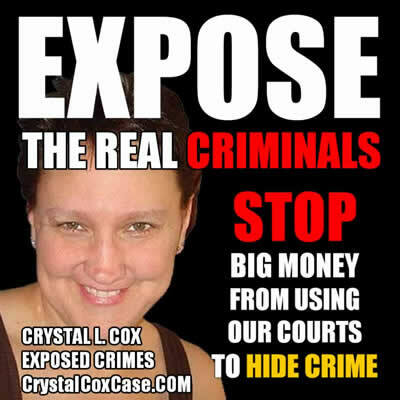 Cox included evidence in her blogs and postings however the courts and government did nothing to stop the crimes. What this all means is our courts are NOT upholding our constitutional rights. Lawyers who are criminals are being allowed to manipulate our courts. Judges are nothing more than lawyers and often they side with their own. Crystal is FOR Accountability and Transparency in AMERICA. Crystal’s story is a great example of how our justice system is abused by lawyers and judges. How the internet CAN be used to EXPOSE criminals. What do the criminals do when you start to win? They start their own campaign to defame.